This is what you see traveling southwest along San Juan CR 2 from Animas Forks to Silverton. CR 22 parallels CR 2 for a couple miles. See the GPS map below. I discovered this nifty diversion by accident. Last year I was heading from Animas Forks ghost town to Silverton. San Juan CR 2 is somewhat interesting from Animas Forks south to Eureka (bumpy but passable by any vehicle if you’re careful), but from Eureka to Silverton is boring smooth well-graded gravel road. However, waiting for you just past Howardsville is San Juan CR 22. CR 22 parallels CR 2, but is hard on the Animas River, is bumpy and full of fun, has puddles to cross (and a creek to ford), and on my Yamaha dirt bike, a much better way to get to Silverton. I had the pleasure of traveling this road again yesterday. The photo above, looking generally west, shows the sign on the north end of this byway. You’ll find a similar sign on the south end looking north. See the GPS track below. Regarding the road, do be careful! When I say the road is hard on the river, I mean there’s the road (one lane) and then there’s the water, with absolutely nothing in between. You positively do not want to go off the road into the river, which right now is swollen out of its banks. But the road is much more interesting and certainly has better views of the river! 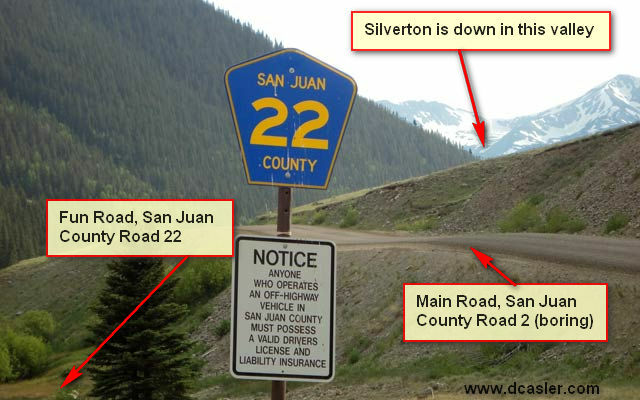 (I think the road is the original railroad line from Silverton to Animas Forks.) Note: I think ATVs would have no problem on this road. A 4WD vehicle should be okay, but definitely NOT a 2WD passenger car! Here's how to find San Juan CR 22--the fun alternative that bypasses part of CR 2. Note that the yellow line is the scale--the line is one mile long. This entry was posted in GPS Tracks, Montrose County, San Juan County and tagged animas river, howardsville, Silverton. Bookmark the permalink.